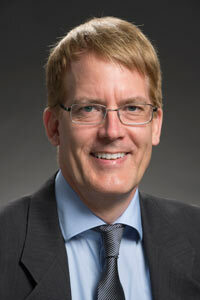 Joseph Lykken is Fermilab's Deputy Director of Research. A distinguished scientist at the laboratory, Lykken was a former member of the Theory Department and is a member of the CMS experiment on the Large Hadron Collider at CERN. He received his Ph.D. from the Massachusetts Institute of Technology and has previously worked for the Santa Cruz Institute for Particle Physics and the University of Chicago. Lykken began his tenure at Fermilab in 1989. He is a former member of the High Energy Physics Advisory Panel, which advises both the Department of Energy and the National Science Foundation, and served on the Particle Physics Project Prioritization Panel, developing a road map for the next 20 years of U.S. particle physics. Lykken is a fellow of the American Physical Society and of the American Association for the Advancement of Science.